Cancer can be a deadly disease, and even its treatments are draining. Those who survive the disease have gone through a lot, mentally, physically, and emotionally. Observed nationwide on the first Sunday in June each year, National Cancer Survivors Day bracelets from AmazingWristbands.com are a way to be reminded of and celebrate people who have survived and a way to inspire those who have been recently diagnosed. A great way to spread the word before, during, and after National Cancer Survivors Day is with customized bracelets. 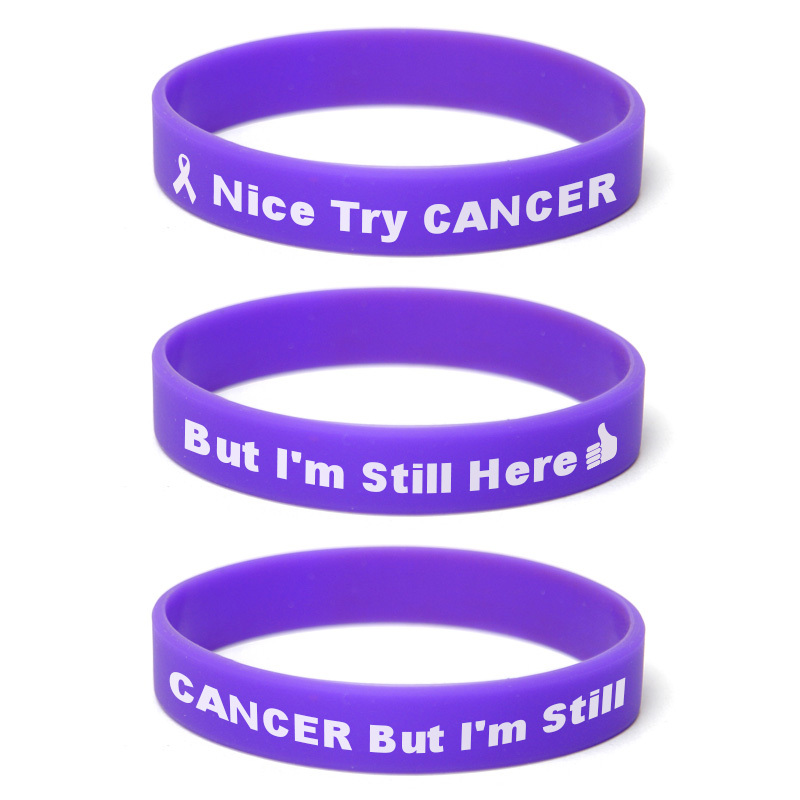 These 100% silicone bands can be in any color and can be imprinted with the National Cancer Survivors Day logo or with phrases like “Cancer Survivor” or “Cancer Support Team.” They can even include names of loved ones who have survived cancer or those who have been recently diagnosed and are facing treatments. According to the National Cancer Institute, cancer is growths of extra cells called tumors that can invade nearby tissues. There are many possible causes for the malignant tumors, including genetic factors, tobacco use, environmental factors, and some types of infections. Treatments vary, depending on the type of cancer and the patient, and some can last months or more. The American Cancer Society estimates that there are more than 14 million cancer survivors living in the United States. Many of our wristbands can be created with our easy-to-use online tool. Or, call us and our professional and friendly customer service agents will help you. When purchasing custom wristbands online, be sure to work with a vendor who offers only 100% latex-free wristbands. At Amazing Wristbands, all our silicone products are non-allergenic and latex free. We offer free shipping, free artwork, free design, and free color matching. There are no minimum order requirements on our most popular wristband styles, and your custom bands will ship within 10-15 days. We offer various styles such as debossed, embossed, as well an custom key chains, silicone rings and an adjustable wristband option. Build your own National Cancer Survivors Day bracelets online today! Does your company have any interest in making a donation of braclets for a fundraiser for cancer ?